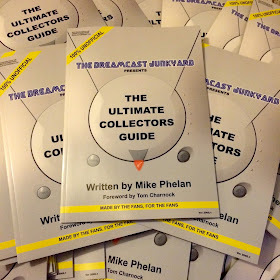 It is with great sadness that we announce that the physical version of The Dreamcast Junkyard Ultimate Collectors Guide is no more. Sega Europe took particular offence to us supplying the community with a printed list of every Dreamcast game officially released for the console and pretty much ordered us to stop selling it. On the plus side, Sega Europe's legal team are fine with us providing this resource for free, and who are we to argue? Below you'll find a nice retrospective video review of the Guide by regular Retro Gamer Magazine contributor Kieren Hawken. To reiterate, there will be no further physical copies of this book produced. However, the PDF can be downloaded for free below and will occasionally be replaced with new and updated versions from time to time. Hey guys. Downloaded and printed out to make my budget copy. Just wondering if there is a front and back image available to download to finish it off? Cheers! Excellent Christiaan - I'm working on the next version of the guide as we speak, it's mainly been obscure Japanese stuff that's been added so far, am always a little bit excited to see some PAL stuff I didn't include! I'll add it in.